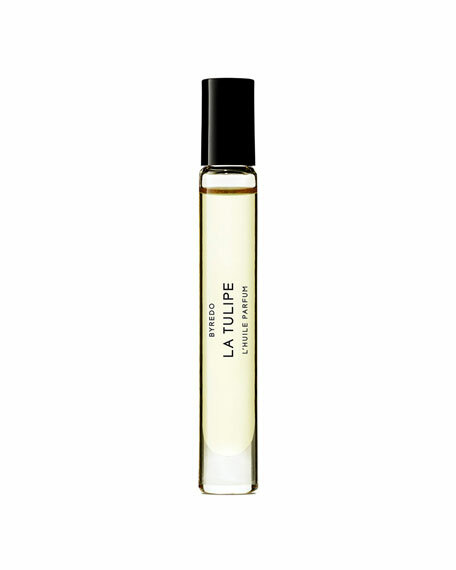 Perfume oils are an alcohol free line of BYREDO most popular perfumes. Available in the very convenient 7.5 ml travel size vial, this product has a roller ball applicator that eliminates messy leakage. The advantages of perfume oils include longer lasting fragrance with smaller amounts of product application on small skin areas such as pulse points. The delicate perfume oil is infused with the vibrant, captivating optimism of the first blooms of the season. This floral fragrance is the epitome of spring when sudden variegated glints of red or purple or pink or orange catch your eye. Rhubarb, cyclamen and freesia offer a fresh first impression, while tulip brings a depth that resonates with base notes of warm blond woods and vetiver. Based in Stockholm, Sweden, Byredo was founded by painter-turned-creative-director Ben Gorham in 2006. Partnering with perfumers Olivia Giacobetti and Jerome Epinette, Gorham's scents are inspired by distinct places (such as Palermo, Italy), moments in time (think 1920s excess and avant-gardism), and works of art (for example, a photograph taken by Inez van Lamsweerde and Vinoodh Matadin), as well as memories and personal experiences. Gorhamborn in Sweden to a Canadian father and Indian mother, raised between Stockholm, Toronto, and New Yorkleverages his global background as a beauty industry 'outsider.' The Byredo difference? A preference for uncluttered notes and a dedication to quality craftsmanship. In addition to fragrancesperfumes, colognes, and roll-on oilsByredo offerings include personal care items such as bar soaps, body creams, lotions, and travel cases, plus scented candles for the home.